As the train lurched out of Adderley Street Station, I looked over at Jenny and her wide 'this is going to blow you away' grin. 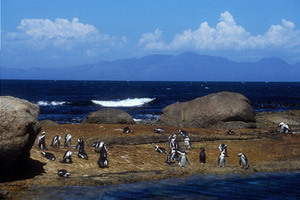 We were headed out of Cape Town towards Boulders Beach - home, apparently, to an eccentric colony of Jackass Penguins. Jenny had to be kidding, I thought. Even with the windows open and the train moving, a heavy curtain of hot air hung across every sweat-smeared, plastic-covered seat. Penguins wouldn't survive this heat, would they? Boulders Beach is aptly named. Gigantic, voluptuous rocks litter the soft stretches of sand that attract locals and tourists throughout the long South African summers. I kicked off my sandals and let the cool foam-edged water squeeze through my overheated and swollen toes. Three layers of factor fifty later, I offered my unworthy body to the sun and dozed. Then I heard it. It was unmistakable. Deep short tones followed by a long, shrill, plaintive cry. It was a donkey braying. I paddled into the sea and around the jutting boulder towards the unrelenting noise. And there was my 'donkey' - a pair of African Jackass Penguins. It was now embarrassingly obvious, why Jackass Penguins were given their unusual name. I edged a little closer to the beach and my cute - if somewhat noisy -- new friends. Two heads cocked sideways simultaneously; two pairs of pink-rimmed eyes blinked in idle curiosity. They were soon satisfied. I was soon abandoned. But not for long. More penguins trundled past, their lumbering gait a source of much amusement.